Well, I finally decided to take the plunge and join your fine organization. In fact, I have taken the liberty of filling out the applications for my brother (Chris) and hunting partner and ex-National Guard comrade (Brent) as well...Merry Christmas to them. My brother and I have spent the last decade going back to our roots with a tradbow and are now building our own rude tackle as well. We have been taking trips out West the last 5 years for mulies and elk (thus far bringing back only memories and a few stone points and sheds). Well, I have come to the point that if I am to ever realize my dream of hunting moose in the Canadas/Alaska I need to make more friends then those two cheap lazy deadbeats....er.....friends . Look forward to meeting you folks at some upcoming event...despite the long distance most of the events are from Frederick. Hello Greg. We welcome you, your brother and your friends aboard. We are a fun loving group of Traditional Bowhunters. Hope to see and meet you and your friends at some of the TBM gatherings. Merry Christmas and Happy Holodays to you and yours. Shoot Straight and Good Hunting. Tony, your hat seems to be famous! I keep hearing about it!! Here is a pic back at you from this year as well... and a Merry Christmas to all!! 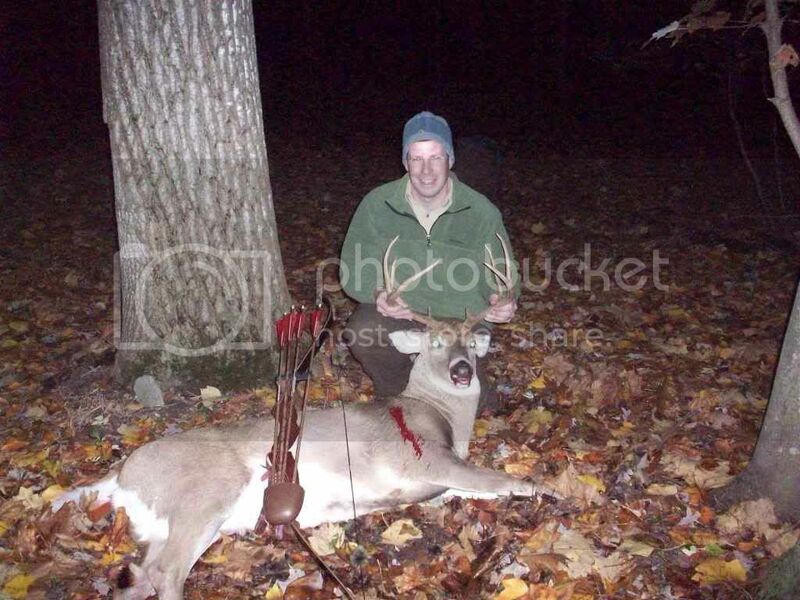 Nice Buck you have there Greg. I am not so sure that the hat is as famous as some say it is(LOL), but it is a nice warm wool German hat. What type of bow is that, and is that a Maryland deer? 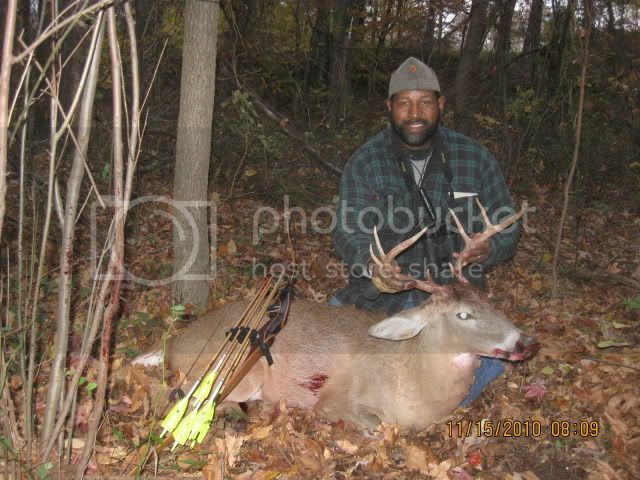 Keith the Buck is #6 taken with the Fox Longbow and I took #7 with my all time go to Robertson Recurve. Yes, the buck was from Frederick county (actually my first real buck (non spike)with any weapon since I started hunting at age 9). The bow is a Samick Redstag. I started out with a 1980's Hoyt Sky longbow but had difficulty traveling with it so I purchased a Bob Lee takedown Hunter. I wanted a backup bow for my fly away trips so I bought the inexpensive Samick. I can only tell a very slight difference between the two bows performance and started shooting the Samick more often. I don't mind banging it around in the brush and I have since ordered 2 more sets of limbs in different weights for as much as the Lee was. The Lee is also plainer and the Samick is easier on the eyes. I still have the Lee but it just gathers dust. 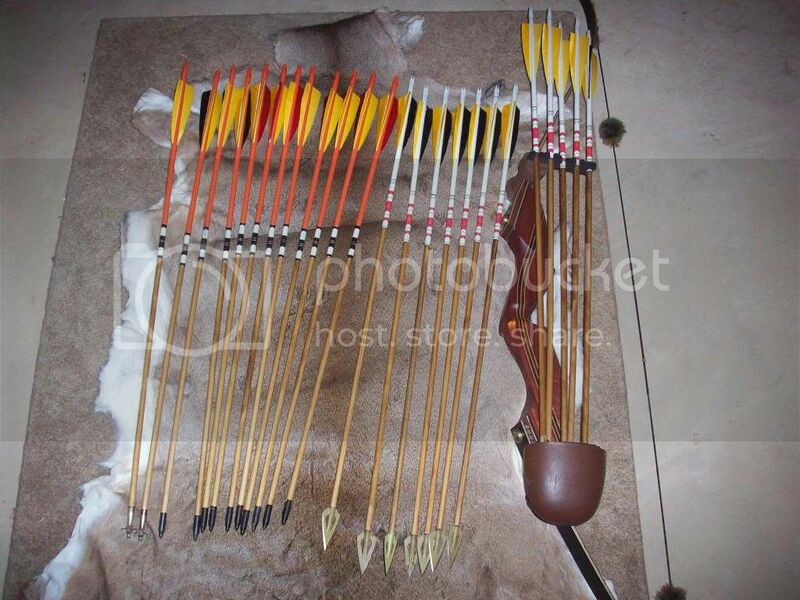 I have been building my own selfbows lately but I haven't been successful hunting with one yet. Great bucks guys. Glad to see ya'll. Thanks Rich. Good to see you are still up and at it. Hope to see you at the shoots. Nice bucks both! Congrats guys. Hey thanks Chop. By the way I enjoyed your story over on Tradgang about your hunt at The Solana Ranch. Congrats on your kill. Hope to see you around at some of the shoots and meetings.